The first thing I think of when I wake up is listening to radio and tv news reports. My favorite smell is that of bread baking, which, as I once heard, “like the sound of lightly flowing water, is indescribable in its evocation of innocence and delight.” A reminder of my childhood, and, in my humble opinion, one of the greatest aromas on earth. My favorite place to relax is along the seaside, watching sea-gulls and listening to the sound of waves washing up the shore. The animal I would most like to be is a seagull. I like the way seagulls fly as much as I love some of their typical habitats - such as, for instance, the Cliff of Moher in Ireland and the Côte Sauvage in Brittany. Moreover I love the sea, any time, in any season, in any latitude, as every seagull is supposed to do. I have always been a strong believer in the Power of Words. They can build up and just as quickly tear down. How we speak says libraries about who we are and what we believe. The last thing I do before falling asleep is read at least a page of the Bible. Congrats Rob and thanks for passing this onto me. Yes I agree, 15 is a lot - I'm still catching up on 15 from a previous award. But I do appreciate this. Interesting facts about you. Nice to learn. India is a place also very dear to my heart. 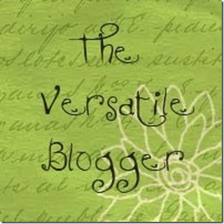 Versatile Blogger! I'd say that's a match. Congratulations to you! Very deserved! Congratulations, Rob! You certainly deserved to receive this award as you are truly versatile in you skill, talent and type of writing that you do. Congratulations on your nomination! Very well deserved! I like the way you write Rob and I enjoyed knowing things about you. First of all heartiest CONGRATULATIONS to you for receiveing this very deserving 'Versatile Blogger Award' ! Congratulations Rob! And many thanks for thinking of me. I'm honoured! First, congratulations to you...you do in fact have one of the best blogs; combining knowledge, insight and wisdom. Second, thank you for recognizing my humble blog and allowing me to contribute to yours.